SCROLL DOWN TO SEE MORE PICS! Hamilton 940, 21 Jewel Railroad Pocket Watch. 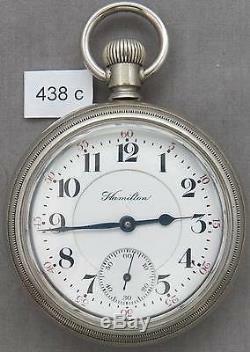 This Hamilton pocket watch is 18 size (case diameter 57 mm). The movement is the marked Hamilton Model 940, adjusted to 5 positions, lever set, micrometer regulator, and fancy early style damasceening. This movement is fully railroad grade and is excellent. The dial is original, double sunk porcelain, and is excellent with no chips or cracks and just a tiny scratch near the center. Hands are original and excellent. This movement is cased in durable nickel silver case by Crescent. This watch runs and keeps reasonable time, but I do not know the history of this watch, so it may need to be serviced. In all of my auctions, the very best images are always BELOW the description. Sorry, this is NOT a "Make Offer" listing. I will not consider or reply to any offers. These charges are the buyers responsibility. The item "Hamilton 940, 21 Jewel Railroad Pocket Watch" is in sale since Wednesday, July 26, 2017. This item is in the category "Jewelry & Watches\Watches, Parts & Accessories\Pocket Watches\Antique".